Like brushing our teeth, we play with our children daily too. 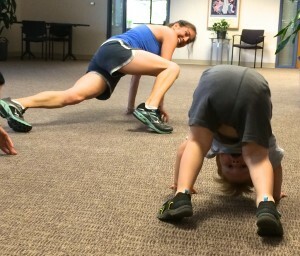 Combine kid time with exercise time! Try peek-a-boo walking planks! Do the planks super slow, super fast, and side-ways. Really. Always side-ways too! Exaggerate the arms and legs while pulling your navel up. Have speed and/or distance races. Throw in push-ups in the middle for more challenge/strength. If you want to make it even more fun, try wheelbarrows.